40 degree temperatures, sunny skies, and right in the middle of the "Chaos" at work necessitated a "field trip" today. I decided I would hit up the Northern parts of the county today, looking for a Snowy Owl in some of the farm fields <spoilers> didn't see it. I thought, given the great weather, I would try Bernard Baker Sanctuary to see what the Savannah Restoration has created. It has been since September of 2014 that I have visited there. It was hard to see it as "bare" as it was, but I have faith in what Michigan Audubon is doing there. The highlight of the hour there was this juvenile Red-headed Woodpecker. 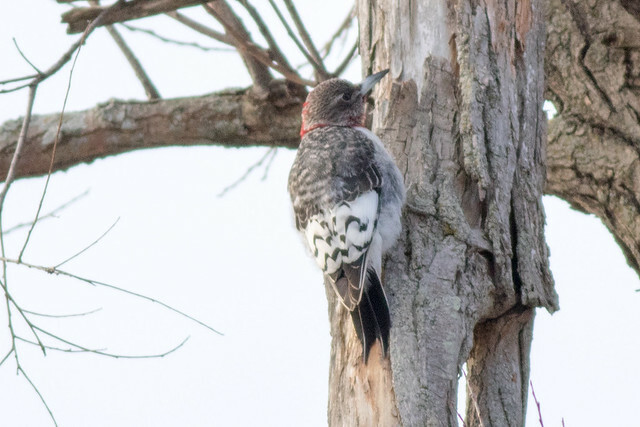 By far my best looks at this rare (per eBird) Woodpecker. After this....well it was mucho driving,and driving and driving. I managed to wander into Eaton County for a bit and found a large group of approximately 200 Snow Buntings in a farm field. I stopped at a random location on 21.5 Mile road to see what I could call up with a mobbing call recording. Turned out, I really didn't need to alert the birds all that much. 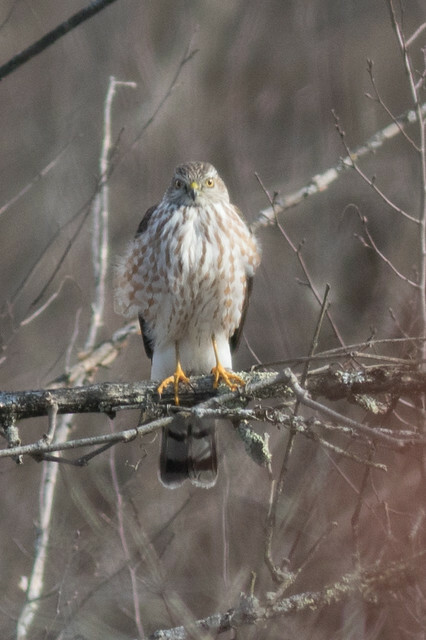 A Cooper's Hawk went racing out in front of me, and across a field into some woods. I thought I'd swing by the Landfill to see if there was any gull activity. Nada, Zip, Zilch!. The drainage pond is frozen over, and the few birds I did see were mostly Crows and Starlings. I thought I'd check one of my "secret" spots on L DR N, before heading home. Great looks at the "normal" winter birds around here. I know this spot is going to give up something good one of these days, but probably not in January. Instead of my normal route from this area, to home, I turned down 11 1/2 Mile Road and headed back east on Verona. There is a spot down G DR N, just south of I-94, that turns in to 13 Mile Road. It has some excellent open areas that are part of a wet area. There are houses nearby, but the east side of 13 Mile Road is relatively unpopulated. I drove down through here slowly and noticed this small "abnormal" looking object on a tree. Backed the Jeep up a little bit and put my binoculars on a small raptor on a limb. 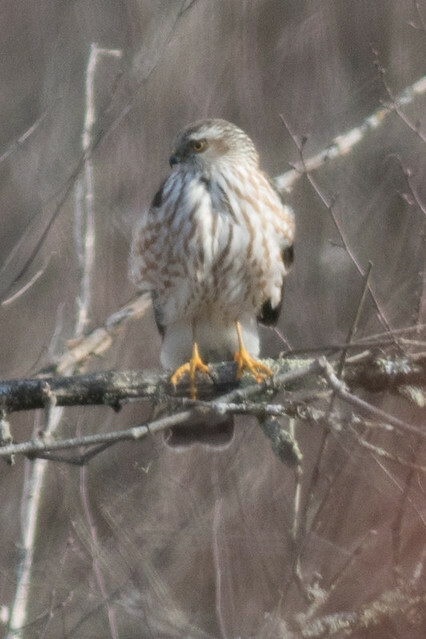 Very promising for a Sharp-shinned Hawk. No doubt about it when it turned its head the nice round head, bugged out eyes, and those skinny legs all lined up. Finally a decent look, and picture of a Sharpie. A second eBird rare bird for the day today. The day wasn't done yet though. Upon returning home I found Pine Siskins on the feeder again. Nice to see it wasn't just a one day wonder with them. Some quick math in my head and I got to thinking that I was having a really good day. Surprising considering how horrible the waterfowl birding is around here right now. Some quick math and I figured I was getting close to 30 birds for the day. I know my record for January was around 30 birds. The sun was still shining so I thought I would hit up 1/2 Mile and Marl Lake road. Maybe some late evening raptors, or owl would make themselves known. This site has been fortunate enough to show Roughies, Red-shouldered, Northern Harriers, Bald Eagles, Red-tailed and Goshawk. I had also some hopes that maybe it would make a good habitat for Short-eared Owl. On my way there I swung by some open water on Beadle Lake, and was able to catch 16 Trumpeter Swans on the lake. Not out of the norm for there, but still flagged on eBird as rare. In addition one lone American Coot was hanging out in the open water. A nice bird to pick up in January, especially since I missed all the waterfowl on Duck Lake earlier in the month that included around 250 Coots. While 1/2 Mile and Marl Lake Road only offered up a couple of Red-tailed Hawks, there were also some Trumpeter Swans that flew over along with some Sandhill Cranes coming in to the open water areas. It looks like we might end up having Sandhills hanging out through the whole winter now. Sandhills would normally be pushed out of this area by frozen over water, but the milder winter has left some open and farm fields clear enough to feed in. As it is they still flagged as rare in eBird for this time period. A 4 rare bird flagged day is not bad at all. A calling Great Horned Owl through the whole time I was out there. This pushed me to 56 birds in this location. Enough for me to submit it as a hotspot for the area. This area is yet another area that deserves to be birded more often. All in all today put my day total at 33. My highest total for a January in the long history of Januarys I have birded...a whole 3. It's definitely not one of the higher numbers you will see in other areas of the state, but not bad for around here. I also now have 44 birds in January, matching what I started out with last year (2015). No this does not mean I am doing another Big Year, just enjoying being away from the Chaos. That, after all, is what it is all about.